"The people who live on the Earth, those who will survive the (destructive) changes (to come), will be evolving into a new species of being. ... I'm not referring right now to the time travelers from Earth's future that are here also." Linda Porter with her daughter, Lisa, on December 25, 1995. October 11, 2006 Albuquerque, New Mexico - The first week of March 1991, I received a brown, legal-sized envelope by Certified Mail postmarked February 28, 1991, from Porterville, California. 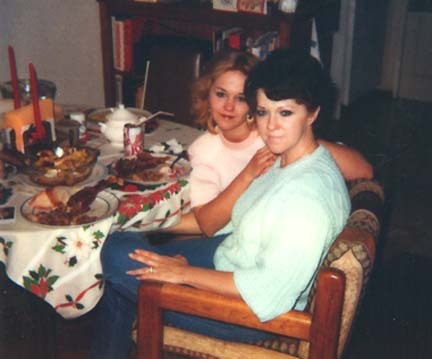 The envelope contained an audiocassette, letter and drawings from a woman named Linda Porter. The day I received the package, I took her audiocassette to play in the car on errands. Her clear and articulate voice impressed me. Linda Porter was an educated person struggling to understand a life full of phenomena that did not fit acceptable categories of reality. She had decided it was important to reach me after hearing a conference presentation I had given in California concerning eyewitness testimony about non-human intelligences interacting with our planet. She was concerned about her vulnerability as a person caught up in the human abduction syndrome and was frightened about the United States government's policy of suppressing the alien presence.